I love breads. They are my downfall. Rolls, I can do without but bread … Especially when it’s fresh from the oven. How do you resist that? And let’s talk about Artisan Bread. It has a crunchy, solid exterior with a soft, chewy interior. When Artisan Bread comes fresh out of the oven, it’s so absolutely delicious. The inside is so warm and perfect. My mother-in-law was the one who introduced me to Artisan Bread. She made it almost every Sunday that we went to her house for dinner. It tastes so good and looks so amazing that I thought for sure it was going to be too hard to make, especially as I was new to cooking and my last breads had come out not so good. Plus she explained how “easy” it was to make the bread. All you do is add in the ingredients, mix, let it sit for 18 hours, mix for a minute, wait for 2 hours, and then use a special pot to cook it in. The “special pot” was what always scared me. She explained how the whole thing needed to be hot and we needed to create an oven inside the oven. At the time, I hardly felt comfortable cooking a baking dish inside the oven so creating an oven inside an oven seemed like an impossible task. But then one day my husband and I were at a store and we found a ceramic pot and decided to buy it and try her recipe. Our first attempt at the bread turned out better than we could have imagined and we haven’t looked back since. This bread recipe is incredibly simple and there’s no 5-minute kneading involved, in fact, there’s no kneading at all. 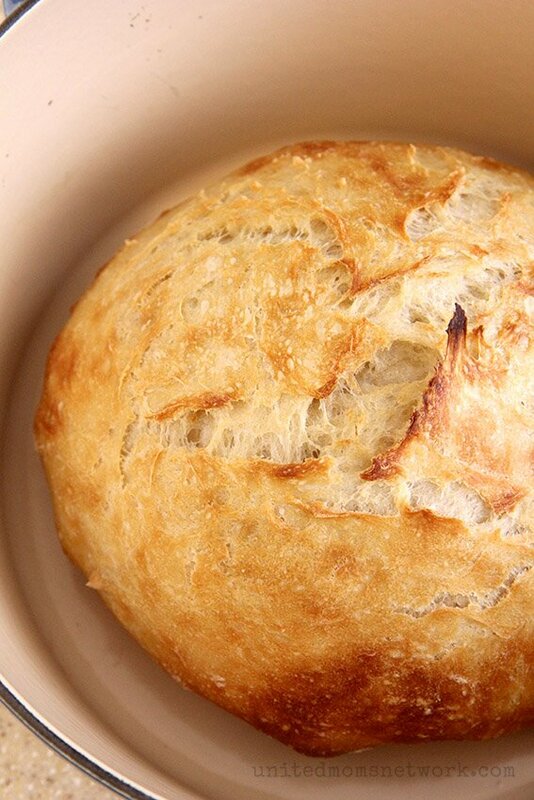 If you are looking for an easy, simple, 4-ingredient, no-knead bread, this is the one! In a large bowl, mix flour, salt, and yeast together so it's distributed evenly. Add in water and mix until flour is incorporated. The dough will be stiff. Mix thoroughly - if the dough is too wet, add a little more flour and if there is too much flour, add a little water. Cover the bowl and let rest for 12-18 hours at about 70 degrees Fahrenheit. The dough is ready when it is dotted with bubbles. (Longer time may be needed for cooler weather). After the rest, place dough on a lightly flour-sprinkled surface. Create a surface tension by folding the dough over itself about 4-8 times or until tight. Spray a bowl with cooking spray and place dough into the bowl and cover. Let it rise for 2 hours. When the dough is ready, it will have doubled in size and will not readily spring back when poked with a finger. At least 30 minutes before the dough is ready, heat the oven to 450 degrees. Place your 6-8 quart heavy covered pot (cast iron, enamel, Pyrex, or ceramic) in the oven while it heats. When the pot has been heated and the dough is ready, carefully place dough into the pot, seam side up. Cover and bake for 25 minutes. Remove the lid and bake for another 5-10 minutes and bake until the loaf has browned on top. *Your pot needs to create an oven within an oven or a Dutch oven. Most of these pot options will work as long as the lid can be placed into the oven as well.